REVO coated PC lens 100% UV400 protection to protect your eyes from reflected glare light. Magnetic spots on frame easy to take down the lens for replacement and the elastic head band and nose protection are also detachable. 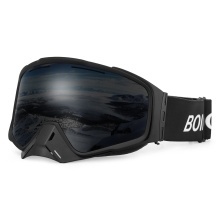 This skiing goggles will provide you guys a free and pleasing skiing and any snow sports experience. 100% UV400 Protection: Strengthening treatment and all round REVO coating makes the lens more protective so as to protect your eyes from reflected glare light. Anti-fogging & Clear Viewing: Coating a film inside the lens and 25-28% VLT for fog-free and clear viewing skiing experience. OTG: Fit over glasses for adults and youth(more than 15 years old), you can still have snow sports with your eyeglasses on. Detachable: Magnetic spots on the frame and lens for easy detachment, and both the head strap and nose cover can be taken down for replacement. Breathable & Fitting: Two layer of sponge and one layer fleece, absorbent and comfortable fit on your face to prevent the inlet, and adjust the elastic band(with wavy gel) to fit on your head and prevent slipping down.